Do a Larger Share of Students Attending the City’s Specialized High Schools Live in Neighborhoods With Higher Median Incomes than Those Attending the City’s Other High Schools? The city’s Department of Education runs nine specialized high schools that are among the most selective of the city’s public high schools. Eight schools admit students based solely on the score attained on the Specialized High Schools Admissions Test and admission to LaGuardia High School is based on an audition. All 8th graders and first-time 9th graders who are New York City residents are eligible to take the test. The score required for acceptance depends on the school and varies each year. IBO used the address of each student attending a New York City public high school in the 2012-2013 school year to identify the census tract in which each student lived and the median household income for households residing in the tract. We then compared the median incomes of the neighborhoods where students lived who were attending the specialized high schools with those of students attending all other public high schools. Students in the specialized high schools came from census tracts where the median household income averaged $62,457 compared with $46,392 for students in other high schools. (All dollar amounts are reported in 2012 dollars). If we rank the census tracts by their median income and then divide the tracts into equal fifths (quintiles), we observe large differences between the share of students in specialized high schools and other high schools from each quintile. Only 11 percent of specialized high school students came from the lowest income census tracts (those where the median household income is less than or equal to $33,862) whereas 30 percent of students in other high schools came from these neighborhoods. Overall, the share of students attending specialized high schools increases steadily and then drops marginally in the two highest quintiles, as we move from the census tracts with lower median household incomes to the census tracts with higher median incomes. For students attending other Department of Education high schools, the pattern is the opposite: the share of students declines as median income increases. Is the City Spending at Least 1 Percent of Its Federal Title 1-A Funds on Parental Involvement? Federal Title I-A funds provide assistance to schools and local educational agencies (in New York City, the Department of Education) that serve a large number or share of students from low-income families. Under federal rules, school systems that receive at least $500,000 in Title I-A funds must use at least 1 percent of their annual allocation for activities that promote parental involvement. Title 1-A requires parental input into determining the activities provided as well as their implementation. Although schools also use additional sources to fund parental involvement, only Title 1-A requires that parents be involved in planning for the use of these funds. 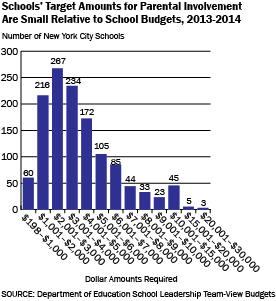 In school year 2013-2014, 1,292 schools (nearly 79 percent) of the city’s public schools received Title 1-A funds. Schools receiving Title I-A funds collectively spent $11.2 million on parental involvement activities in 2013-2014—more than double the required minimum expenditure of $5.2 million for the Department of Education. The education department gives schools a targeted amount of 1 percent of their Title 1-A funds to spend on parental involvement in the department’s school budget allocations. 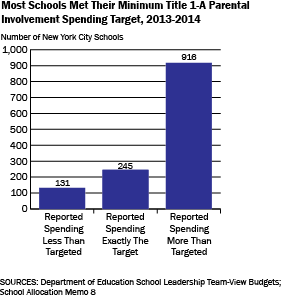 In school year 2013-2014, 10 percent of Title 1-A schools with parental involvement spending targets self-reported spending below the amount targeted and nearly 71 percent reported spending more than their assigned target amount. Nearly 70 percent of schools receiving Title I-A funds were targeted to spend between $1,000 and $5,000 for parental involvement. For schools spending in this range, the expected expenditure equaled about 0.1-0.2 percent of an average school budget. Lack of standardized reporting limits analysis by type of expenditure.